The state of Minnesota is known as the land of 10,000 lakes. Our national park this week protects four major ones. The National Park Service says water is the foundation of this wild and remote place. Welcome to Voyageurs National Park! In the 1700s, French Canadian fur traders starting coming to the area seeking beaver fur and other animal coats. The product was in great demand in Europe. The fur traders traveled to and from the area for business. They took canoes to get around. The boat trips were often long and hard. The waters and wild animals created great dangers. Voyageur life became legendary. The men were seen as brave adventurers. But they were also romantics. They became known for singing songs as they navigated the waterways. Of course the voyageurs were not the first people in the area that is now Voyageurs National Park. People first arrived there about 10,000 years ago. They were mostly nomadic, and did not settle permanently. In the last 1,000 years, Native American tribes settled in the area, including the Cree, Monsoni and Assiniboin. The Ojibwe were the residents of more modern times. They served as guides to the fur traders. They also provided canoes and other important items. 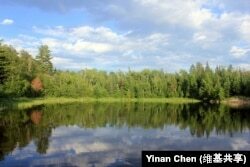 Voyageurs National Park covers almost 88,500 hectares. About half of that surface is water. Creating the park was a long and difficult process. Minnesotan state lawmakers first proposed the idea in 1891. But, it was 80 years before Congress established the park. President Richard Nixon signed the bill that finally established Voyageurs as a national park in 1971. The start of a trail at Voyageurs National Park. The park protects four major Minnesotan lakes: Rainy Lake, Kabetogama, Namakan and Sand Point. Rainy is the biggest. It covers about 930 square kilometers. It is a popular fishing lake. Fishers may catch walleye, northern pike and smallmouth bass. In the winter, thick ice covers Rainy Lake. Visitors can walk and drive on it. 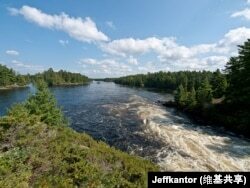 Rainy Lake meets with Namakan and Kabetogama lakes at Kettle Falls. A dam was built on the falls in the early 20th century. Along with it came the Kettle Falls hotel. It housed traders, loggers and visitors searching for gold in the area. The hotel fell into disuse in more modern times. But in 1987, the National Park Service made repairs and improvements to the building. It is the only indoor place to stay in the area. A carpenter and artist from Chicago named Jack Ellsworth built a summer home on the lake in the 1940s. He then designed, built and cared for the rock gardens over 20 years. The artist also created garden sculptures from native stone. There were once about 200 rock sculptures. Ellsworth stopped caring for the gardens in his older age. When the National Park Service took control of the land, the gardens needed repair and restoration. Today, it is an interesting place to visit within the park. 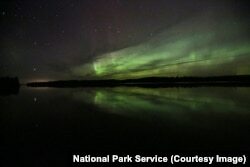 Voyageurs National Park may be best seen at night. Officials there like to say that “half of the park comes out after dark.” Certainly, much of its magic does. The most spectacular light display on Earth is sometimes visible at Voyageurs. The Aurora Borealis, or northern lights, appear periodically in the night sky as streaks or clouds of light. The lights are most often white or soft green. However, they sometimes deepen into colors like yellow, red, blue, and even purple. The northern lights are not always immediately recognizable. But keep watching. If the light you see comes and goes, or intensifies over time, you may be witnessing the Aurora Borealis. Along with the northern lights, Voyageurs is a great place to see meteors. These bursts of light cross the area’s black skies mostly in August, during the Perseids Meteor Shower. Meteors, often called shooting stars, form when pieces of ice and dust cross into Earth’s atmosphere and begin to burn brightly. The display of natural fireworks is a great way to finish the day at Voyageurs National Park. You can fall asleep under the stars and be sure that more extraordinary nature awaits you when day breaks in Voyageurs National Park. Caty Weaver wrote this story with materials from the National Park Service. Ashley Thompson was the editor. Have you ever seen the northern lights? If so, describe them for us in the comments section! remote - adj. far away from other people, houses, cities, etc.